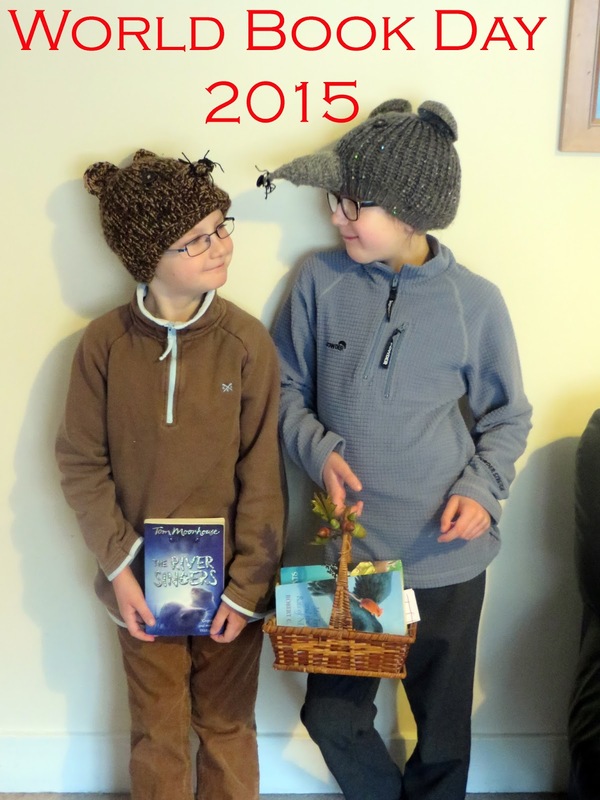 Sally Poyton: One Families Ups and Downs of World Book Day Costumes! One Families Ups and Downs of World Book Day Costumes! The approach to this years World Book Day is filled with the usual costume dilemmas and elation but for me it also has a tinge to sadness. The bittersweet felling is as a result of it being my youngest offspring’s last WBD in primary education, and therefore probably his last year to dress up! 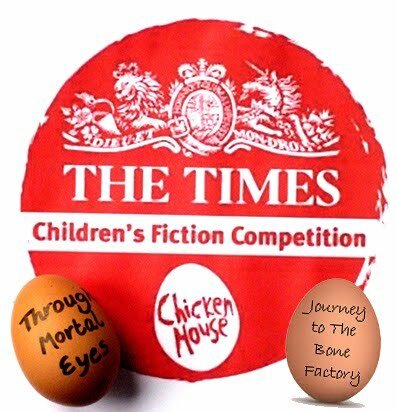 So after years of WBD horrors, dramas and successes this will be the last WBD as most of the upper school choose to mark it in other way: quizzes and in fact one school, (my daughters) have the teachers dress up and not the pupils as it’s ‘More fun that way’ apparently! So, as my son deliberates whether to go as Mr Munroe from Chris Riddell’s Ottoline books, or Douglas Adam’s Marvin the paranoid android from The Hitchhikers Guide to the Galaxy (but fashioned like the 2006 film played by Warwick Davis and voiced by the late great Alan Rickman) I thought I’d take a look back at the highs and lows of our families WBD costume dilemmas. Cue panic – cue scrounging a sheet of green card from the class craft draws, followed by an evening of frantic costume making. 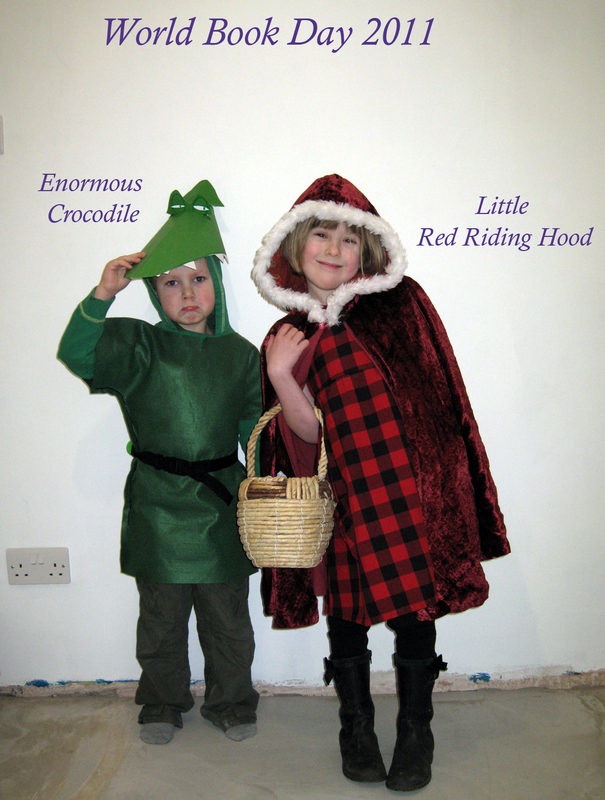 For my son, we re-used a green tunic we had made for a Robin Hood costume, and added a self-made Roald Dahl & Quentin Blake inspired Enormous Crocodile hat, and for finished it with a green tail from some silly catch the tail game. For my daughter, I borrowed a red cloak from a friend (I had a 12 mile round trip to collect it) and used it as the finishing touches to a Red Riding Hood ensemble. The extra evening of notice really made the difference between epic fail and scraping a pass. Having had WBD sneak up on my twice I made a mental note to never allow it to happen a third time. So the next year, we started costume preparation a few weeks before. 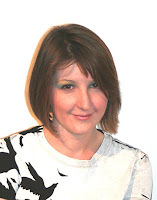 At the time both children were big into Greek Myths, my son obsessed by Lucy Coats 'Atticus' books, and my daughter by Rick Riordan’s 'Percy Jackson' series. Percy Jackson was easy, all I had to do was make wings for the shoes, and borrow a pre-crafted trident from a crafty friend. 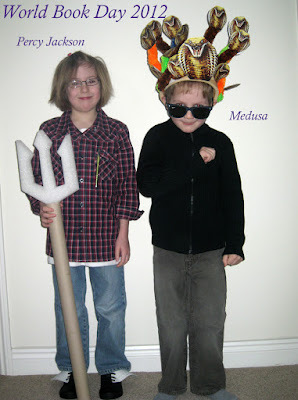 But my son wanted to be Medusa, so we went about fashioning a hat using pipe cleaners and pictures of snake heads for her hair. The costumes were fun, and the kids loved them- they also got a second outing at my daughters Greek Myth themed birthday a few weeks later. So the next year we started to preparations way in advance or at least I did for my son, who wanted to be ‘Frankie’ from the (then) recently published ‘My Big Fat Zombie Goldfish’ by Mo O’Hara. This as I’m sure you can imagine wasn’t the easiest of costumes to create, so I opted again to make a hat. 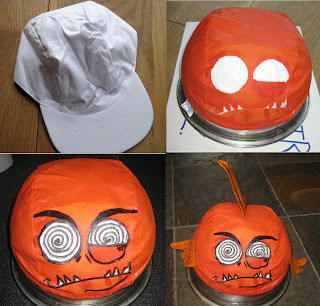 The hat took planning and to my son’s joy and my relief turned out well. My daughter’s costume was a dream by comparison, because it was the first and only time she completely arranged it herself. She and her school friends all decided to go as characters from Jill Murphy’s Worst Witch books, and sorted out their own costumes from their collective dressing up boxes – easiest WBD costume ever. And on a whole a successful year. 12 months later and our lives (due to relocation) had completely changed: new house, new school, new car, new puppies, new jobs, new EVERYTHING, and living in a tiny rental house with most of our stuff in storage. So this year we – cheated. 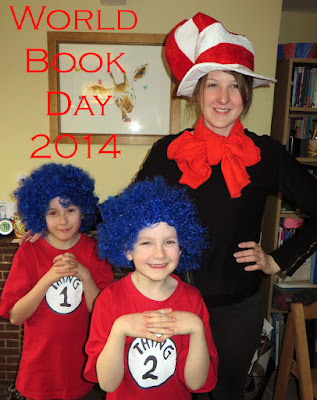 I had been asked by the children’s school to come in and do some WBD writing sessions, so we went as a family and brought a Cat in the Hat and Thing 1 and Thing 2 Costumes. Despite not having made the costumes, they were a success, and Thing 1 and Thing 2 still get used for school fun runs and alike! My Daughters last year of Primary school and therefore her last year of dressing up was back to costume panic – as both children were reading books about rodents, my daughter – ‘Mrs Frisby and the Rats of NIMH’ by Robert C. O'Brien and my son ‘River Singers’ my Tom Moorhouse, and therefore a rat and a water vole costume was requested. … The Telegraph online newspaper ran an article; ‘World Book Day costumes: A parent's 7 stages of crisis’ and I was featured under section ‘7. 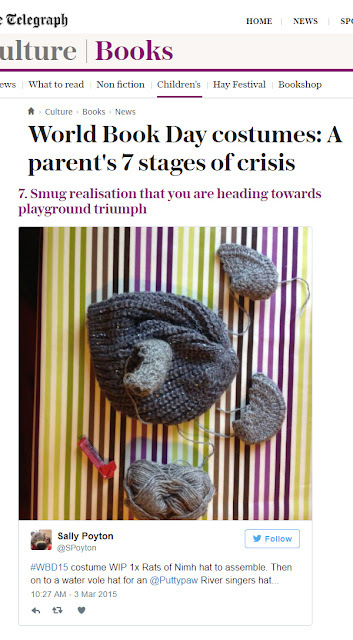 Smug realisation that you are heading towards playground triumph .’ Being outed as a smug parent by a national newspaper did somewhat mar the feeling of that year's WBD costumes being a success. Last year, 2016, was the first year of only needing to produce ONE WBD costume as as I’ve mentioned my daughters big school only permit teachers to dress up – weird I know. I however was busier than ever starting a new business and working for the Roald Dahl Museum and Story Centre, meaning my time for costume making was somewhat limited. I therefore ran with the theme from work, and my son went in a BFG costume I brought. However being my son, he was not content without improving it, so we added a cape, a self-made dream trumpet (tin foil and toilet rolls, Blue Peter style!) and a suitcase (well old fashioned brief case) full of dream jars, plus a pair of paper plate ears. I wasn’t convinced it was successful WBD costume but he was happy which the main thing is. 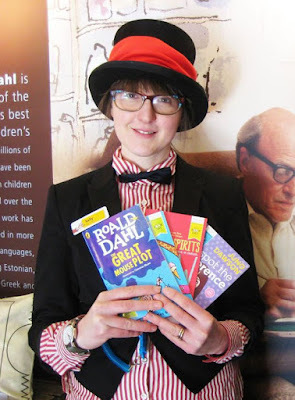 You know I said that we only needed one outfit for 2016 WBD, and that I was prepard, well, at work, The Roald Dahl Museum and Story Centre, then told me the day before that also needed to dress up as a Dahl character, so cue - costume panic! So it brings us up to date and the impending WDB 2017 which is just two sleeps away. You may be asking what did we decide, a Marvin, or a Mr Munroe? Well actually he changed his mind and he going as Gandalf from the Hobbit (which he’s currently reading). Of course it’s not without its issues, the beard we ordered was delivered and it was the wrong colour; white not grey (Gandalf is Grey in the Hobbit you know) so had to be returned, and we still have to go a whittle a branch to be a staff (although thanks to Doris finding a fallen bit of tree should be easy!) So far preparations seem to be going well. 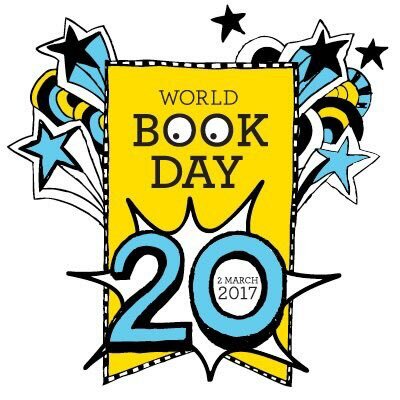 And hopefully 2017, our final year of WBD dressing up will be a success. Now where did I put that wizards hat? That is just astonishing. You are a good mum! Boy, you're going to miss that last minute panic next year!